Cassie Lane is a writer and former model who has worked extensively around the world since being scouted in Italy at the age of sixteen. Returning to Melbourne after living in LA for nearly three years, she quit modelling and began studying psychology and communications. She has since gone on to complete a Master of Creative Writing at the University of Melbourne. Cassie now works as a content writer. 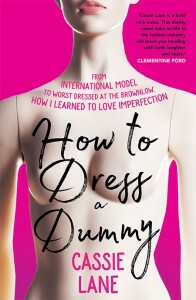 How to Dress a Dummy is her first book.